For as many faults as this episode has, “All I can see is a horrible rainbow” is a great line. “No Blair Witch knockoffs” is good too. I’ve always been partial to Krusty’s “This bit is dying” line. I am dissapointed. You didn’t even take time to mention how horrible the ending is. I can remember seeing a documentary of the studio process, and this was the eisode they were making at the time. 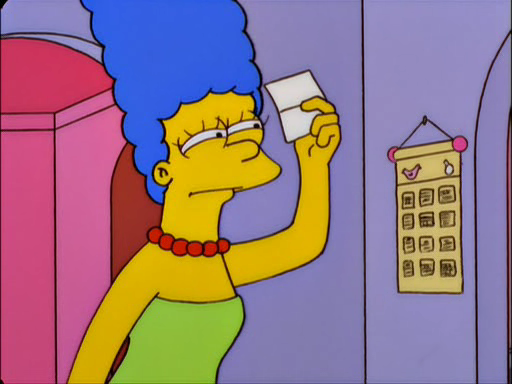 Marge saying “Shut up Becky! There, I said it” for some reason got a massive laugh from the writers. I didn’t understand why then, I didn’t understand why it was funny when watching the full episode, and now I see it as that hollow laugh you guys describe on the commentaries. I stopped watching not too long after. I hate how they made Becky really want to kill marge making her paranoia justified that was the WORST move in an already bad episode.